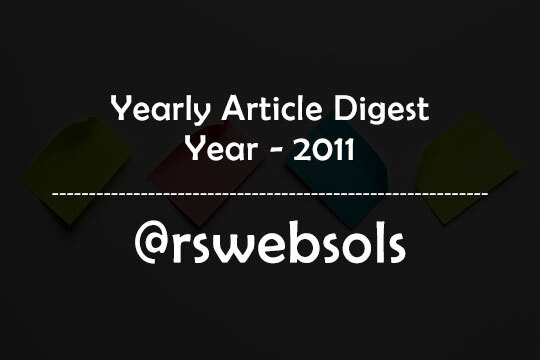 This is an article containing the yearly article digest of the year “2011” at RS Web Solutions (@rswebsols). You can easily find all our published articles from January 2011 to December 2011 in a ascending order by date. This is a yearly archive page to help our readers to give an easy-to-find list of yearly articles. Along with the article title, you can also able to read a short excerpt of each article. If you find an interesting article that catches your attention, you can, of course, click on the “continue reading” link to read the entire article. Happy reading! In this post I will discuss about a good blog advertising website called BuyBlogReviews.Com. Before telling anything about their services I want to let you know the alexa traffic rank of this website is below 7500. So you can understand how good this website is doing in the web market. In a very short span of time Adobe Flex gained huge popularity in the technical market and become a good choice for developer to build cross platform web applications. 4) What Are the Differences Between Joomla 1.5.X and Joomla 1.6? Joomla is a content management system (CMS) for web sites. Current estimates (as of January 14, 2011) are that Joomla powers 2.6% of all web sites. Joomla version 1.x was replaced with Joomla 1.5x several years ago, and the changes were significant. Late on January 10, 2011, version 1.6 was released. This version has some wonderful changes, and many parts of Joomla were re-written from scratch to accomplish these feats. Here are some of the changes.